Normally as a car becomes older, mold, bacteria, fungi and other micro organisms begin to grow. This is especially true in areas rarely accessed such as the vents of the air conditioner and on the evaporate right behind the dashboard. As time passes, there is the gradual development of an unpleasant odor from the air conditioning unit which starts off light and grows to become very disgusting if not taken care of promptly. The best solution to this problem is to locate the drain tube of the car’s air conditioning system. Once you have identified it, start by checking it to make sure that it is working properly. Next, use anti-bacterial treatment to get rid of any bacteria that may have grown along the cooling system’s vent and behind the dash panel. Finish by injecting a little of the treatment solution into the air conditioners case. It is advised that you carry out the above steps when the air conditioner is turned off but with the fan on. This will help evaporate any liquid that may find its way on to the coils of the cooling unit. If each time you turn on the air conditioner in your car you smell gas, the car may have a gas leak. What happens is each time the A/C is turned on the gas smell ends up being sucked in and mixed with the fresh air which the cooling system might be supplying to the interior of the car. Dirty air filters are also responsible for another weird car A/C related smell. Air filters, if not cleaned properly, tend to collect dirt, stagnant water, dust mites and other pollutants over time. All this collectively causes the foul smell which passes through the car’s cooling system each time the car is turned on. Whenever you turn on the car’s cooling system and the car’s interior gives off a sweet smell, it is advised that you have the air conditioning system checked immediately. This so-called sweet smell is often caused by toxic liquid ethylene commonly referred to as antifreeze. This sweet smell is caused by a leak within the cooling system either around the heater’s core, coolant’s housing unit, radiator or pipe/hose. 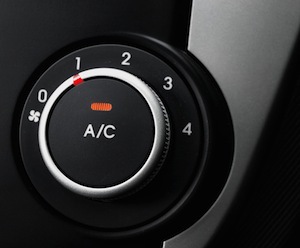 For more information about auto air conditioning repair service, contact Sallas Auto Repair at (816) 765-6060 today — we look forward to serving you.